Week 6 – Love Rocks! What an awesome privilege it is to give…to those in need and those not in need. What a joy it is to share a word of encouragement with everyone you encounter be it via a word or a simple smile knowing it is a valuable deposit into a life. What an opportunity it is to express your appreciation to those who have contributed to your life experience in some way or other be it ideal or not. Indeed we receive a truly great gift when we express LOVE. Love is like perfume…you can’t sprinkle it on others without getting some on yourself. It is a magnificent power that we all have that can lift a heavy spirit, open doors that seem closed, and connect you to most anyone in any part of the world…it is universal, intoxicating and has the power to change and in some cases actually save a life. It puts a pep in your step and delight in your heart. 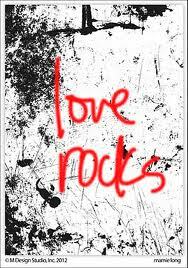 Truly love rocks!! This week as part of our MasterKey Mastermind readings (facilitated by Mark Januszewski and the Fabulous Davene) we shifted to the second scroll in the book, The Greatest Salesman in the World by Og Mandino. It’s main theme is, “I will greet this day with love in my heart” making “expressing love” a top of mind intention for us all as we navigate each day. Just imagine for a minute if everyone in the world, or our country, state, city…or even our immediate family was committed to greeting each day with love in their hearts. What transformation we would see immediately…what a welcomed breath of fresh air we would experience. A few of my favorite statements in the scroll are: “I will make love my greatest weapon and none on whom I call can defend against its force.” “…for just as my love is my weapon to open the hearts of men, love is also my shield to repulse the arrows of hate and the spears of anger.” One additional passage suggests a really great idea for us all to employ…check it out. It says, “…how will I confront each whom I meet? …in silence and to myself I will address him and say I love you. Though spoken in silence these words will shine in my eyes, un-wrinkle my brow, bring a smile to my lips and echo in my voice, and his heart will be opened.” Can you imagine that. Wouldn’t that just be terrific?? What the world needs now is love sweet love. It’s the only thing that there’s just too little of. What the world needs now is love sweet love…no, not just for some but for everyone. Lord, we don’t need another mountain, there are mountains and hillsides enough to climb. There are oceans and rivers enough to cross, enough to last till the end of time. What the world needs now is love, sweet love. No, not just for some but for everyone. bet you know, Celeste, all about the power and benefit of giving and demonstrating love. Your writing bears witness to that truth. Thanks for providing an inspiring example of application, of walking the walk, not just talking the talk.